Winter is here once again, and everywhere neighborhoods are decked out with Santa Clauses and reindeer, wreaths, holly, and all things green and red. While we take the time to celebrate the holidays this month, we also need to take the time to give a little extra love and attention to our four-legged friends, especially when the temperatures plunge. Help your pup stay happy, warm, and healthy by following these 5 tips below! Keep Your Dog Indoors – Don’t leave your precious pup outside when the temperature drops! They are safer indoors, except when taken out to exercise. 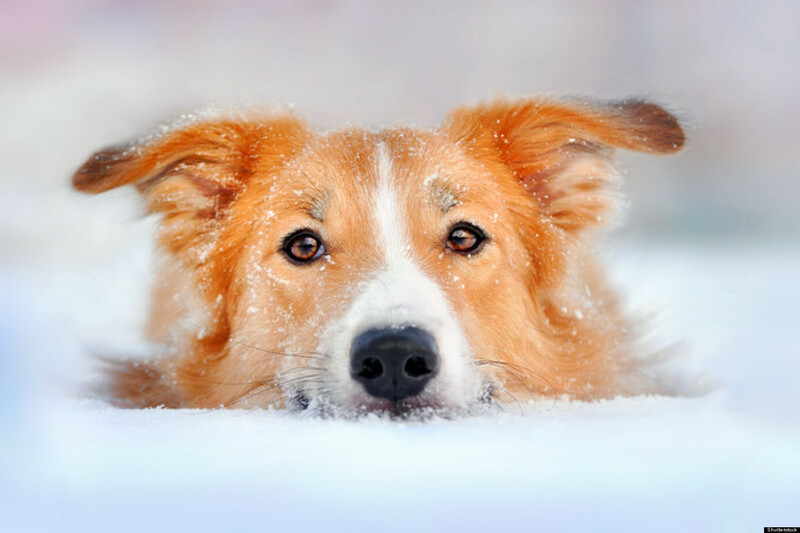 Additionally, windchill can threaten a pet’s life, and exposed skin on the nose, ears, and paw pads can quickly freeze and suffer permanent damage. Remember that very young, very old, and short-haired dogs should never be left outside without supervision and might enjoy wearing a sweater when you take them on a wintertime romp. Protect Your Dog Outdoors – If your dog has to spend a lot of time outside for some reason, make sure that you provide adequate, dry, and draft-free shelter. The shelter should be large enough to let your pup sit and lie down comfortably yet small enough to retain his body heat. Make sure that the floor is raised a few inches off the ground and covered with cedar shavings or straw. Give Her Plenty of Water – Pups who spend loads of time outside need more food and water in the winter since keeping warm takes quite a bit of energy. Check your pet’s water dish routinely to ensure that the water is fresh and unfrozen. Also, invest in plastic food and water bowls instead of metal since a dog’s tongue might stick and freeze to metal when the temperatures plunge. Protect the Paws – All dogs need some amount of exercise, even in the cold winter months, but you need to take extra precautions of the additional substances on the ground. Salt and other chemicals that are used to melt the snow and ice can irritate the pads of your pup’s feet, so be sure to wipe all of your doggy’s paws with a damp towel and pat them dry. Your pet could get sick whenever he tries to clean his paws if you don’t take this precaution. Notify Others of Dogs Left in the Cold – If you happen to see a dog left out in the cold, don’t walk away. Please be sure to tell the police about it! Make sure to document everything such as the date, time, exact location, and type of dog you saw, along with as many details as possible about the situation. Remember, protecting our dogs from the cold is just as vital as protecting them from the heat, and your actions could save a dog’s life! If you can’t bring your dog in when you go to work on a cold day or if you need to leave your dog behind this winter as you go on a trip, please don’t leave him in the cold! Instead, bring your buddy to BauserHaus! Your pup will stay warm and will enjoy interacting with the other dogs and our caring humans at our facility. Call us at (314) 961-3911 or find us online at www.bauserhaus.com to learn more! This entry was posted in Tips and tagged BauserHaus, dog winter tips, doggie daycare STL, how to protect dog in winter. Bookmark the permalink.